Over at Switched On Set, we’ve just featured the Spike Lee and Eric Haze-designed G-Shock watches. 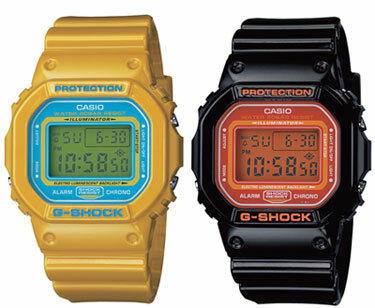 But also announced today is a range of Casio G-Shocks inspired by the 1980s to celebrate the company’s 25th anniversary – the DW5600CS. It’s described as a new twist on the original design, offering a typically 80s digital watch in a choice of glossy yellow or black. As you might expect, the watch has water and shock resistance, along with an EL backlight with afterglow, multi-function alarm, 1/100 second stopwatch, countdown timer, flash alert and 12/24 hour formats. Both land at the end of September, no price as yet. They look fabulous. Hope it’s got a whole range of musical alarm settings. Those were always the best watches when I was at school.